On Wednesday evening, September 12th, the Palestine-Israel Journal , in partnership with the Friedrich Ebert Stiftung [a foundation associated with Germany’s Social Democratic Party] organized a public event at the American Colony Hotel in East Jerusalem to launch our latest and very timely issue devoted to “Oslo 25 Years After: Realities, Challenges and Future Prospects.” A large audience of over 100 people, including the Ambassadors of Norway and Sweden, representatives from the American Embassy Tel Aviv Branch and Jerusalem Consulate and almost all of the Consulates and Representative offices in Jerusalem and Ramallah, along with internationals, Israelis and Palestinians came to attend the public event which was convened one day before the 25th anniversary of the actual signing which took place on the White House lawn on September 13th, 1993. Unfortunately, after the opening remarks and the presentation by Gilead Sher [chief of staff for Prime Minister Ehud Barak, 1999-2000] in the midst of the presentation by Ziad AbuZayyad [co-editor of the Palestine-Israel Journal], a group of about 15-20 young primarily male Palestinians entered the room where the event was taking place, and began shouting slogans in Arabic against Palestinian-Israeli cooperation at the event, claiming to the Palestinian panelists that it was a form of “normalization” with the occupation. They continued shouting slogans over and over again while approaching the panel and smashing the water glasses, and the microphones, despite the fact that the Palestinian-Israeli joint venture of the PIJ focuses its issues and activities on opposing the occupation and defending the quest for a two-state solution based on the establishment of a Palestinian state in the West Bank and Gaza, with East Jerusalem as its capital, alongside the State of Israel. 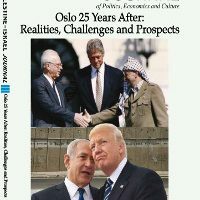 While understanding the anger and frustration of young Palestinians connected to the worsening conditions of their lives under the continuing occupation, the lack of hope on the horizon and the negative reaction to Oslo given that 25 years after the signing we are further away from a solution than ever, we regret the fact that the protesters do not understand that we, Palestinians and Israeli who believe in peace based upon ending the Israeli occupation and creating an independent Palestinian state with East Jerusalem as its capital alongside the state of Israel on the 4th of June 1967 lines are allies, struggling together to end the occupation. We at the PIJ will continue our joint struggle to end the occupation and resolve the conflict, for the sake of our future generations. Hopefully the protest will be seen as a warning sign by all who seek a resolution of the conflict that things are reaching a boiling point, and that action must be taken and support given to all of us who are actively seeking to end the occupation, for the sake of both the Palestinian and the Israeli peoples. ← Palestinian Recognition of Jewish State?